Expanded and updated, NFPA 72®, National Fire Alarm and Signaling Code® reflects the latest technologies, applications, and research. Update to the new benchmark for fire alarm systems, with requirements that reflect code user needs and concerns in the field today. 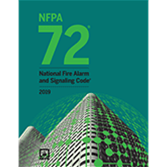 The 2019 edition of NFPA 72, National Fire Alarm and Signaling Code presents the most advanced provisions ever developed for the application, installation, location, performance, and inspection, testing, and maintenance of fire alarm and emergency communications systems -- including Mass Notification Systems (MNS). This edition features important updates for designers, installers, and AHJs—from added testing requirements for Energy Storage Systems (ESS), to new requirements for HVLS fans and air-sampling smoke detectors. In a major change to scope, NFPA 72 now addresses carbon monoxide protection. Major revisions to the requirements for fire service access elevators and occupant evacuation elevators (OEE) coordinate with changes made in ASME A17.1/CSA B44. Annex text is added for clarification. Extensively revised requirements for occupant evacuation operation (OEO) coordinate with the new best practices and field research. In addition to revised requirements for area of refuge (area of rescue assistance), Chapter 24 now includes requirements for stairway communications systems, elevator landing communications systems, and occupant evacuation elevator lobby communications systems. Chapter 14, Inspection, Testing, and Maintenance now incorporates valve-regulated lead-acid (VRLA) batteries. New and updated definitions bring NFPA 72 up-to-date with current technologies. For example, the terms strobe, light, and visible are changed to visual notification appliance, recognizing use of LED products that can be used for fire alarm. Interested in the 2016 edition of NFPA 72? Find it here. For editions prior to 2016, find them here. 7.7 Records, Record Retention, and Record Maintenance. 10.8 Detection and Signaling of Conditions. 10.12 Fire Alarm Notification Appliance Deactivation. 10.13 Carbon Monoxide (CO) Notification Appliance Deactivation. 10.16 Emergency Control Function Status Indicators. 10.17 Notification Appliance Circuits and Control Circuits. 10.18 Annunciation and Annunciation Zoning. 10.19 Monitoring Integrity of In-Building Fire Emergency Voice/Alarm Communications Systems. 12.6 Monitoring Integrity and Circuit Performance of Installation Conductors and Other Signaling Channels. 17.5 Requirements for Smoke and Heat Detectors. 17.8 Radiant Energy–Sensing Fire Detectors. 17.9 Combination, Multi-Criteria, and Multi-Sensor Detectors. 17.13 Sprinkler Waterflow Alarm-Initiating Devices. 17.14 Detection of Operation of Other Automatic Extinguishing Systems. 17.15 Manually Actuated Alarm-Initiating Devices. 17.16 Fire Extinguisher Electronic Monitoring Device. 18.5 Visual Characteristics — Public Mode. 18.6 Visual Characteristics — Private Mode. 18.7 Supplementary Visual Signaling Method. 18.9 Textual and Graphical Visual Appliances. 18.11 Standard Emergency Service Interface. 21.3 Elevator Phase I Emergency Recall Operation. 21.5 Fire Service Access Elevators. 21.6 Occupant Evacuation Elevators (OEE). 21.7 Heating, Ventilating and Air-Conditioning (HVAC) Systems. 21.8 High Volume Low Speed (HVLS) Fans. 21.9 Door and Shutter Release. 21.11 Exit Marking Audible Notification Systems. 23.4 System Performance and Integrity. 23.5 Performance of Initiating Device Circuits (IDCs). 23.6 Performance of Signaling Line Circuits (SLCs). 23.7 Performance of Notification Appliance Circuits (NACs). 23.9 In-Building Fire Emergency Voice/Alarm Communications. 23.10 Fire Alarm Systems Using Tone. 23.13 Guard’s Tour Supervisory Service. 23.14 Suppressed (Exception Reporting) Signal System. 23.15 Protected Premises Emergency Control Functions. 23.16 Special Requirements for Low-Power Radio (Wireless) Systems. 24.4 In-Building Fire Emergency Voice/Alarm Communications Systems (EVACS). 24.5 In-Building Mass Notification Systems. 24.6 Wide-Area Mass Notification Systems. 24.7 Distributed Recipient Mass Notification Systems (DRMNS). 24.8 Two-Way, In-Building Wired Emergency Services Communications Systems. 24.9 Two-Way Radio Communications Enhancement Systems. 24.10 Area of Refuge (Area of Rescue Assistance) Emergency Communications Systems, Stairway Communications Systems, Elevator Landing Communications Systems, and Occupant Evacuation Elevator Lobby Communications Systems. 24.11 Information, Command, and Control. 24.12 Performance-Based Design of Mass Notification Systems. 24.13 Documentation for Emergency Communications Systems. 26.3 Central Station Service Alarm Systems. 26.4 Proprietary Supervising Station Alarm Systems. 26.5 Remote Supervising Station Alarm Systems. 26.6 Communications Methods for Supervising Station Alarm Systems. 27.8 Emergency Communications Systems (ECS). 29.13 Inspection, Testing, and Maintenance. Customize your copy of NFPA 72®, National Fire Alarm and Signaling Code® or the companion NFPA 72 Handbook with time-saving Tabs.